This LED colour combination is fixed: Blue/White. LED 1: This LED illuminates the top window only when the switch is in the ON position. LED 2: This LED illuminates the custom text, icon and is active continuously when the dash light circuit is active. 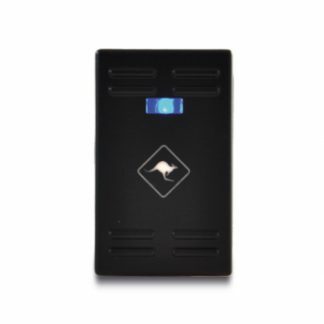 Suitable for the Ford Ranger PX1 and is an exact fit in to the original business card holder. Also compatible with second-generation Mazda BT50 from October 2011. (This is not suitable for the PX2). This switch has a maximum current rating of 5 amps @ 12 volts and is to be used in conjunction with a relay. Custom engraved icon illuminates white via the dash light circuit, once the switch is pushed on, the upper clear window also illuminates blue. 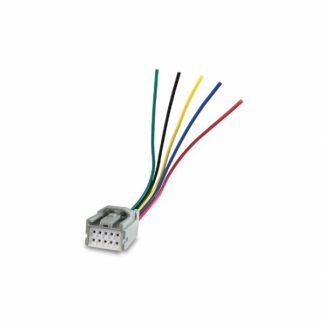 Supplied with connector and 100mm length harness in blister pack.